This lady is walking along the pit lane which, as of yesterday, was nose to tail with the team trucks. 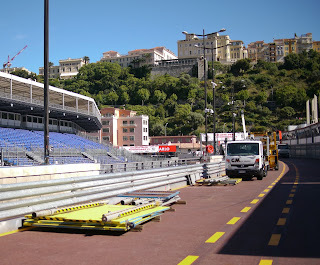 In the smaller photo you can see a clearer shot of the pit lane with the stands opposite that house the television crews with the gallery above for the VIPs. In the background is le rocher. Yesterday afternoon a truck caught fire at the Ste. Devote roundabout. The tyres exploded and the area was filled with thick black smoke. The fire brigade got it under control but the tarmac was been badly burned and the truck had sunk into the road with the heat. The track surface is now undergoing urgent repairs. Reports say this could mean that this famous first corner after the start will be very slippy as there won't have been enough time for the tarmac to 'seep' or set - indeed it could even break up with so many cars running on it during the practice sessions, the qualifying and of course the race itself. To see photos and read more, click on THIS LINK. She does not look like she is worried too much about the truck tires burning and asphalt. Elle aime beaucoup faire du shopping!